Successfully Added 1GHz CPU Android 4.0 Phone "ThL V11" - 4.0 Inch Screen, 3G, Dual SIM (Black) to your Shopping Cart. 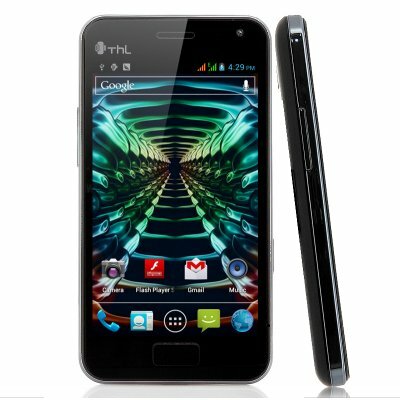 ThL V11 Android 4.0 branded phone with a high resolution 4 inch screen and a 1 GHz CPU. This is your chance to buy a trusted brand’s phone at a great wholesale price! ThL has been around for more than 10 years and is a settled brand in Europe as well as in the United Stated, manufacturing great Android Phone. The V11 is one of ThL’s flagship phones and rocks a 1 GHz CPU and 512MB of RAM. In combination with Android’s great operation system, Android 4.0 Ice Cream Sandwich, the V11 is able to run all your favorite applications smoothly. Download apps from the Google Plat Store offering more than 600.000 different apps and you will always have entertainment at the tip of your fingers. Supporting Dual SIM on both GSM 850/900/1800/1900/ and WCDMA 850/2100 networks, the V11 can be used almost anywhere in the world. On top of that, 3G data connectivity and a great A-GPS chip come standard on this phone. Shoot magnificent 5MP pictures while traveling or in the club and use the front facing camera for Skype video conversation. The ThL V11 is now in stock and ready for next day shipping. Offered with a 12 months warranty, this phone is great to make some profit with when reselling it. Brought to you by the leader in wholesale Android Phones, Chinavasion. Ottimo prodotto. Ottima assistenza al cliente. Spedizione rapidissima e tracciata. Ottima qualità prezzo-prodotto. Il telefono è di ottima qualità sia i materiali sia la potenza del processore. Gira bene sul web e telefonate su skype, il touch molto sensibile e preciso. L'unica cosa che non riesco a capire è perchè non si aggiorna l'ora attuale(italia) ne con wifi ne con gps, rimane impostato con differenza di 6 ore sarà quella del giappone, boh. Tutto risolvibile impostando l'orario manualmente.